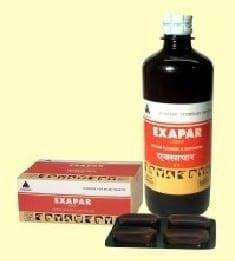 Exapar is unique combination of potent medicinal herbal extracts that tones up uterus for better post partum reproductive efficiency. Stimulates uterine muscular tissue for timely expulsion of placenta after calving. Regulates lochial discharge and helps in post-partum cleansing of uterus. Facilitates expulsion of retained placenta. Helps in timely and proper involution of uterus. More number of herbs with more quantity of each herbs ensure better results. Extracted form ensures faster & better results. Glass bottle ensures efficacy till usage. Retention of placenta,Postpartum Anoestrus ,Repeat Breeding, and for uterine cleansing. Soon after calving , or in case of retained placenta, administer double dose (100 ml for large animals) twice on first day followed by single dose twice daily for 3-5 days .